You’ll find many radiant floor heating systems on the market today, each with their own designed application. Have you decided that radiant heated floors are right for you? Wanting warm floors for your home is a good place to start, but then how do you know which is the best radiant floor heating system for your situation? The best place to start is by doing some well-informed research. Don't be afraid to contact a radiant heat expert (888.488.9276) and ask questions. You can also get a free floor heating quote without any obligation. Make a list of what you expect your radiant floor heating system to accomplish. Which areas of your home or building project are going to need coverage? What type of flooring are you looking to heat? Once you have a good list in place, you can begin your research on typical floor heating systems and what they offer. One great online radiant heat resource is the radiant heat directory. This page has links to proven products, reputable distributors, radiant heat product documentation, illustrations and even video links. It may be the single most informative web page out there, so it’s definitely worth checking out. 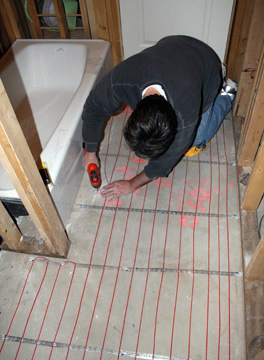 You'll also find some handy radiant floor heating installation tips on this site. If you are a newcomer to the radiant floor heating market you may be overwhelmed with the countless choices available. It’s easy to get lost and confused when faced with vast amounts of information available and the varying technologies and heat cables you can purchase. When in doubt be sure to investigate which manufacturers have been around the longest. This usually means they are seasoned, hold valuable amounts of information and technology at their fingertips, and have already done a lot of research on the consumer’s behalf when it comes to radiant floor heating. Your desire for warm floors in your home is their bottom line. So it pays for them to have your best interests at heart as well as their own. In your search for the best radiant heat provider, identify which manufacturers have a good track record and a long history of production and sales. The important thing is to take your time, ask questions, make informed decisions and value what other customers have to say about specific manufacturers. Soon you’ll discover for yourself the many comforts of a radiant heated floor.